Filling Thai soup with chicken, lettuce and loads of garlic! Oh yes, winter has finally arrived. What better way to celebrate it than with a piping hot bowl of soup. While you are at it go for big Thai flavors with tasty broth, tender chicken, delicious fried garlic and crunchy iceberg lettuce. Wait…, Iceberg lettuce? Using Iceberg lettuce in a warm dish may have never crossed your mind, but trust me and give it a try. Even if fried or cooked it still stays somewhat crunchy making it a great addition to soups and stir-fries. Dare swapping your paksoi with iceberg for once and you will know what I mean. Cooking times of rice-noodles heavily depend on the brand and variety you buy. So just follow the instructions on the pack and you are good to go. Once cooked, rinse them with cold water in a colander and let drain till needed. What are you waiting for? 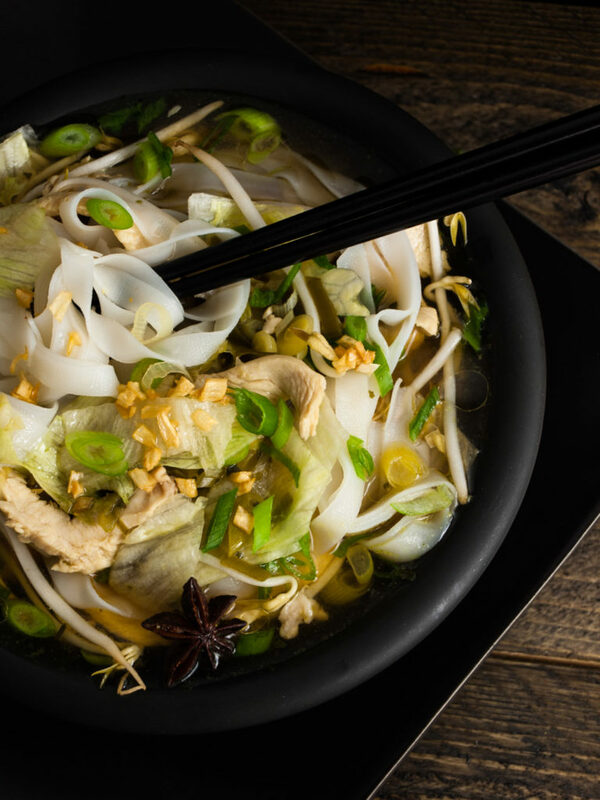 Give iceberg a chance and make this easy soup as a filling main meal after a long day or as an entrée for an Asian feast! Nothing beats a warm filling bowl of soup in the winter! Some prepping before you can dig in! Cook the rice-noodles according to the instructions on the pack. This should usually not take longer than 5 minutes. Cut the garlic into fine cubes. Put a small frying pan on medium-high heat. Add the cooking oil and fry the garlic until golden brown and crunchy. Make sure it does not burn. Take pan off the heat and save for later. Cut the iceberg lettuce into bite-size pieces. Slice the spring onions finely. Bring the chicken broth to the boil in a large pot and add the star-anise, soy sauce, fish sauce and rice vinegar. Reduce heat to a simmer. While the broth simmers, slice the chicken filet into very fine strips. Add the thinly sliced chicken to the broth and simmer for another 5 minutes. Taste the broth and maybe add some more fish sauce, soy or vinegar depending on your taste. Assembly time – put together a delicious soup! Divide the cooked rice-noodles among the bowls. Top the noodles with bean sprouts, chopped iceberg and sliced spring onions. Fill the bowl to the rim with the hot broth and make sure everyone is getting an even amount of chicken slices. Sprinkle over crunchy garlic and drizzle with the garlic-infused oil. Season with freshly cracked black pepper, garnish with some more sliced spring onions and serve immediately! Let me know what you think about the recipe in the comments below! Have you ever used iceberg lettuce in other warm dishes before? Did it live up to your expectations? If you think the broth needs some tweaking, or if you want to comment on anything else of the recipe – please do so underneath! Let’s make this recipe even better together!